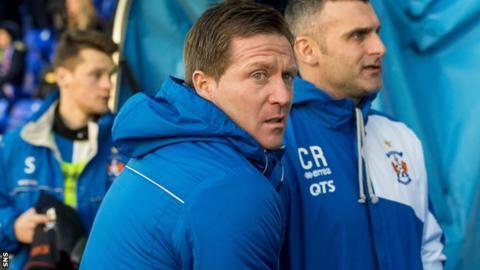 Kilmarnock manager Gary Locke downplayed the significance of dropping into the relegation play-off place after the 2-1 defeat to Inverness CT. Given results elsewhere, Kilmarnock sank to 11th place in the Premiership and face a tough test at home to second-placed Aberdeen next weekend. "You've still got plenty of games to go," Locke told BBC Scotland. "We certainly need to start picking up points and picking up wins; the boys are well aware of that." Locke lamented "sloppy defending" from Kevin McHatte that led to Iain Vigurs' opener - the defender tried to prevent a corner but instead directed the ball to Liam Polworth who rolled Vigurs in for a simple finish. "It's a really poor goal from our point of view to lose," said Locke. "We're well in control of the situation. A lack of communication and we gift Inverness a goal. "We end up having to open up and chase the game and the first-half performance wasn't great from us. We did better in the second half but you can't afford to lose goals like we did today." Kilmarnock have now taken just two points from the last 18 available. Strangely, those points have come from a 0-0 draw at Celtic Park and a home draw with Dundee United when down to 10 men for the majority of the match. "It's very frustrating," explained Locke. "Last week I was delighted with the performance. "This week, in the second half the lads put plenty of effort and commitment into the game but we've got to show a little more quality in the final third and certainly defend better than we did for the two goals today. "The response in the second half was better but we need to make sure we're working and fighting hard for 90 minutes." Inverness Caledonian Thistle manager John Hughes was delighted with a win that moved his side up to seventh place, but suggested they must maintain a high standard of performance for the full 90 minutes. "(It was a) Great first half performance, scored two great goals and did the business," said Hughes. "Second half, not so good, Kilmarnock come at us, (we) stop passing the ball, but on the counter attack I felt if we were a little more clinical in our passing then we could've scored another few goals. "When you're not doing that it comes on top of you. The whole second half we stopped passing the ball. We need to learn that lesson. "We have to learn that if you give the ball away cheaply not doing the fundamentals properly, then you're going to give the other team the advantage." Hughes pointed to poor decisions in the final third as preventing a more comfortable end to the match. "A lot of the work we've been doing on the training pitch is sucking teams in to go and counter," he said. "Our decision-making in the final third when we've got three-versus-twos, four-versus-threes, needs to be a lot better, a lot more clinical and put the game to bed. "I thought the first-half performance was as good as we showed against Celtic for 60 minutes but once again it's not that 90-minute performance, and that's what we're looking for."